In this circuit we demonstrate how to use SCRs to control low-voltage pulsating DC to operate homemade LED light panels. While in this circuit I use the Arduino, the concepts should work with any number of micro-controllers using either hardware interrupts or polling. 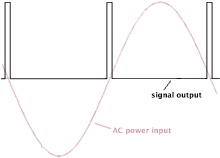 We must use pulsating DC or the SCR won't operate properly. See Basic SCRs/Triacs. This illustrates to process with full-wave unfiltered D.C. The LED strings are composed of four high intensity white LEDs in series. At 3 to 3.5 volts each four in series operate at 12-14 volts. Q1 used in this test was a S4015L 400 volt SCR that can handle 15 amperes of current. That can handle a lot of LED strings. Same schematic using MOC3010 series triac opto-coupler.